The GlobeCore Company offers a large selection of equipment for the purification, filtration, degassing and recovery of contaminated insulting oils and hydraulic fluids. The main feature and benefit of oil processing systems from GlobeCore is their high productivity and the high quality of results after only one cycle of filtration. The way a particular piece of equipment functions will depend on its type. 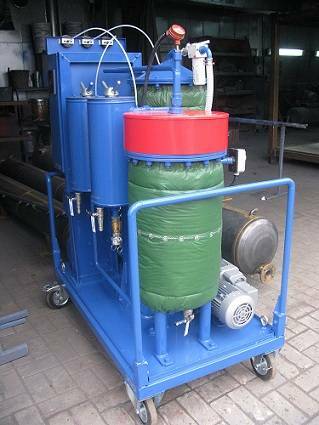 For example, the oil filtration station DSPD-1.7 M (DSPD 4) is designed for mechanical purification of diesel fuel and insulating oils having a viscosity that does not exceed 70sSt at 50°C/122°F. The DSPD 4 is used during the initial installation, maintenance and operation of oil-filled equipment. Inherent in the design of this type of equipment, is its the ability to work in a variety of technically challenging conditions and in high and low temperature extremes. A more complex pattern of purification is found in the GlobeCore Mobile Oil Station SMM-1.0M. It is designed to process the same type of transformer oils as the DSPD 4, but provides cleaning to Grade 9 after the initial pass and up to purity Grade 13 after repeated passes through the filter unit. Later models such as the GlobeCore CMM line of oil processing units are capable of processing contaminated transformer insulating oils regardless of the level of contamination. The CMM line is the best equipment in the world today for the maintenance of electric power transformers. The versatility of the GlobeCore modern oil filtration systems allows the GlobeCore equipment to process various kinds of insulating oils and hydraulic fluids for all types of power equipment. GlobeCore units are designed to provide the operator with the maximum energy and cost savings over the service life of the equipment and the service life of your transformers. Moreover, the GlobeCore Process of oil filtration does not require the readjustment of power equipment or staff training. Easy maintenance and high performance make the GlobeCore line of equipment the most cost effective in the world today.